Not long ago I was in a hotel room, juggling four applications on my teeny, tiny notebook screen. I didn't realize till then how dependent I've become on my dual ViewSonic monitor setup at home. If you're never had a dual monitor experience, you're missing out on both a higher level of productivity and more pleasurable computing. Imagine seeing your e-mail app on one monitor and your browser in the other. Have a link in e-mail? Just drag it across the void onto the other monitor and into the browser. Ditto for scraping numbers from Microsoft Word and popping them onto the other monitor displaying Excel. If you don't believe me, read what my buddy Tom Mainelli said when he upgraded to a dual monitor setup over 3 years ago (see "Double Your Fun With a Second Monitor"). Most modern PCs have video adapters--either built into the motherboard, or a separate add-in card--that have dual monitor ports. Most of the time adding a second monitor is straightforward. Turn off your PC, connect the cable that comes with the monitor to the second port on the video adapter, and boot. Both XP and Vista will spot the other monitor (probably thinking "it's about time...") and talk you through the setup steps. If you don't have dual ports, or you use a notebook, and still want a dual monitor setup, there are ways. My colleague Eric Lai, at Computerworld, explains how in "Step-by-Step: A Three-Screen Workstation for $230 or Less." You can also read my ditty, "Two Monitors Are Way Better Than One." If you're out of desktop space and into gadgets, watch the video of Samsung's 22-inch 2263DX, which sports a secondary 7-inch monitor. As much as I feel more productive using two monitors, I never liked the cockamamie way they were arranged on my desk. Both sat on a platform I bought eons ago in order to give me more space. I'm trying out the Visidec Freestanding Double Horizontal stand from Atdec. 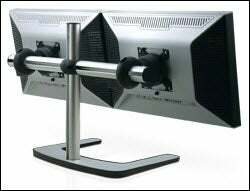 It mounts both monitors horizontally on one pole. Atdec has other ways to do the mounting--vertically or four-up. My monitors are different sizes--23 and 24 inches--and it doesn't matter to the mount. The Atdec mount can handle 12- through 24-inch LCDs and each can weigh up to 25 pounds. Putting together the mount took about an hour (think Ikea, with an Allen wrench, 21 screws, clips, and other doodads), the toughest part of the setup. Removing the monitors from their existing bases, holding the cables out of the way, and doing it all without dropping anything wasn't easy, either. If you can get someone to help you, (hey, honey, you busy? ), the job will be easier. I liked being able to stick the power and monitor cables inside the post of the mount, and ultimately, when the project was done, it looked good. Of course these puppies aren't cheap (but neither were your monitors, right?). The two-up horizontal mount discounts for about $170. Physically setting up two monitors is one task; herding them with software is another matter entirely. I use UltraMon, a $40 tool to control both monitors. The program outshines any video adapter utility, or any other video program, for that matter. For instance, I can quickly move windows or applications from one monitor to the other and UltraMon corrects for display size differences. I can have separate taskbars on each monitor and assign hotkeys to do my bidding--say, move, maximize, or even reposition app windows. I've set up UltraMon shortcuts that load favorite apps on boot and move the windows to a specific monitor. I'm not alone in loving UltraMon. In the article I mentioned earlier, my colleague Eric Lai raves about the program, saying it's "the creme de la creme of multimonitor software." Grab a trial version or even try the beta upgrade and see what author Christian Studer is offering in the upcoming version. BTW, Christian is very responsive to support e-mails (and e-mails in general), and his company's forum is well-maintained. UltraMon supports all versions of Windows, including 98, Me, 2000, XP, and 2003; the Vista version is in beta. I know you'll trust me on UltraMon, but just in case you want to shop, look at "Your Monitor with These Utilities." Here's a narcissistic time waster for you. How Many of Me will tell you, well, how many of you there are in the US. I checked and found out I share the name "Steve Bass" with 94 people, and likely half of them owe me money. I love it when professionals create ads with Photoshop and make some of the funniest, egregious errors. Check out bunches of them on Photoshop Disasters.